This robo bozo is kind of a dodo. Clowns and robots. While they may seem vastly different at first glance, a little look at their histories reveals that they're more similar than they seem - both started out loved by many, but as the years went by, evil portrayals of the two became more popular. Because of their similarities, many creators find it fitting to combine the two, creating a Robot Clown. While clowns and robots as we know them were not introduced until much later, early concepts for the two date back as far as Ancient Greece, making them Older Than Feudalism. Back then, there were "rustic fool" performers - predecessors to clowns - and stories about artificial life, such as the bronze man Talos. Both clowns and robots, however, really started to become popular in the 1800's, when performer Joseph Grimaldi served as the Trope Codifier for most things we associate with clowns nowadays, such as wearing facepaint and frilly clothing. Also at that time, remote-controlled machines were becoming more common. Then, in 1921, the idea of sentient, human-like robots became well-loved thanks to the release of Rossum's Universal Robots, and continued to increase in popularity thanks to the works of sci-fi writers such as Isaac Asimov. These works fueled a fear of robots dominating humans, leading to the prominence of tropes like A.I. Is a Crapshoot and Killer Robot. However, clowns were still well-received... until the late 1900's, when Monster Clowns became more popular, and the traditional Non-Ironic Clown all but faded away in the eyes of the public. But it's somewhat understandable, considering that both robots and clowns have a bad tendency to fall into the Uncanny Valley. For this reason, it seems logical that if you style a Killer Robot after a clown, that makes it even scarier. Even in works where most, if not all, the characters are robots, having one be a clown (or vice versa) can really help him or her stand out. And so Robot Clowns have surged in popularity, just like evil human clowns. However, not all Robot Clowns are bad. Some works use these characters the way they were meant to be portrayed - as fun, helpful characters, devoid of malice. Whether a Robot Clown is good or bad, as long as it clearly exhibits traits of both a robot and a clown, it belongs here. Even the qualities that clowns and robots don't share lend a hand in the effectiveness of these characters. Clowns are usually flamboyant and energetic, while robots are static and emotionless. The contrast between the two can make for an interesting character when they are combined. It's also worth noting that, like their human counterparts, Robot Clowns are mainly used In-Universe as entertainers, unlike "normal" robots, who are mainly used as servants. Sister Trope to Robot Athlete and Robot Maid as well as a Subtrope of Ninja Pirate Zombie Robot. See also Hostile Animatronics, if the character is evil. For more clowns with extraordinary abilities, see Magical Clown. Mobile Fighter G Gundam: The Jester Gundam is a clown-themed mech. Aside from its white face and colorful armor, its most powerful attack is "Top Mode", where it transforms into a giant spinning top to create illusions and confuse enemies. The very first issue of the very first The Avengers series offers an extremely weird example of this trope, with the Hulk disguising himself as a robot in clown makeup. In the video for Poets of the Fall's "Carnival of Rust," Zoltar the Fortuneteller is an automaton clown trapped in a glass case, albeit an exceptionally sad, decrepit one, with monochrome, flaking makeup and faded, tatty clothes. Playing the role of a Pierrot gone to seed, he attempts to free himself from the Carnival by futilely begging for his latest customer's love via an Obsession Song. One of the enemies you can find in Bomberman Hero's Clown Valley is a knife-throwing clown on a rolling ball. As all the characters in Bomberman are robots, these enemies fit the bill, and are all the more creepy for it. Dark Cloud 2: The Repulsive Ringmaster Flotsam rides around on a huge, clown-faced Spider Tank called Halloween. The hero, Max, can customize his Mini-Mecha into a robot clown. Later on, Flotsam himself is given a cyborg body after his near-death, but still retains his clownish facepaint and colorful suit. The Marionette is a mime-like animatronic who is controlled by a music box. It plays with this trope, however, because it seems very different from the other animatronics. Some speculate that it isn't a robot at all, but none know for sure what it really is. Funtime Foxy is a Lighter and Softer (In-Universe, at least) version of recurring animatronic Foxy whose bright colors make him or her resemble a clown. It was set up as an attraction for kids to play with. However, the kids ultimately tore it apart, turning it into a mechanical monstrosity known as Mangle. Balloon Boy is a childlike animatronic who looks like a clown due to his red nose and cheeks, big smile, and colorful clothing. He also has the ability to interfere with the protagonist's various gadgets. Interestingly, in Five Nights at Freddy's: Sister Location, all of the main animatronics have a clown motif, with bright color schemes and even the appearance of wearing facepaint. As if this didn't pull them far enough into the the Uncanny Valley, their faces are more technologically advanced than previous animatronics, with movable brows and cheeks. This leads to quite the Nightmare Face when they split their faces open, revealing the robotic endoskeleton inside. Kirby: Triple Deluxe has an enemy called Clown Acrobot who is implied to be a robot, not just because of his name, but also because he's an emotionless Perpetual Smiler clown with a metallic-looking face. LEGO Batman 2: DC Super Heroes: One of the many things that The Joker and Lex Luthor do during their Villain Team-Up is attack Gotham City with a giant mech designed to look like the Joker. Clown Man of Mega Man 8 is a clown robot who likes to play with trapezes with his extendable arms, and is the boss of a toy-themed amusement park. The Koopa Clown Car has been Bowser's personal weaponized helicopter since Super Mario World. It has a clown face which changes its expression depending on its status. Several variations exist such as the "Junior" for his son and the Koopalings and the "Fire" starting in Super Mario Maker, but all of them bear the clown face. Downplayed in Super Mario 3D World: Motley Bossblob is — as the name says — more of a Blob Monster Clown, however his Chrome Champion look really gives him a robotic vibe. Chortlebot, a boss from Wario Land: Shake It! is a flying robot clown head. Its Gag Nose turns into a spikeball, which Chortlebot launches at Wario. It has Creepy Circus Music as its boss theme, and a distinct, high-pitched cackle. The Adventures of Figaro Pho gives us the Robot Dog Rivet, whose red nose and lips, along with his perky, playful behavior, make him very clownlike. Batman: The Animated Series: In one episode, the Joker introduces a new minion called Captain Clown. Batman is visibly confused by this new minion's superhuman strength, until he breaks the minion's face, revealing that he is actually a robot. This gives Batman the realization that killing the minion will not break his strict Thou Shalt Not Kill rule, and so the minion meets his doom in a trash compactor. The Joker actually sounds shocked, crying out "You killed Captain Clown! ", though it's impossible to tell whether he's trolling Batman, genuinely trying to be funny, or crazy enough to actually equate the (rather crude, and definitely not sapient) robot with a living person. 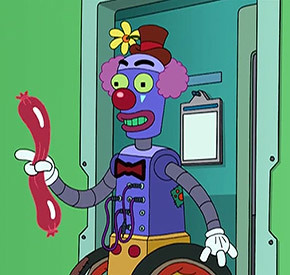 On the Futurama episode "Bendin' in the Wind", an injured Bender is treated by a robot version of Patch Adams in a clown outfit. Chuckles the Clown from League of Super Evil is a robot created by Dr. Frogg when he was a kid, to get back at kids who didn't invite him to their birthday parties. Chuckles appears to be a Non-Ironic Clown at first, but when he is wound up, he reveals his cruel nature, playing painful pranks on the team. Rugrats: "The Mysterious Mr. Friend" involved the babies fighting an army of malfunctioning clown robot toys Stu invented. What's New, Scooby-Doo? : The Monster of the Week in "A Terrifying Round With a Menacing Metallic Clown" is, as the title indicates, a giant robotic clown. It starts out disguised as an obstacle on a mini-golf course, then comes to life to terrorize golfers. It turns out to be controlled by Mayor Snipper, who specifically built it to scare people away from the golf course because he believes that golf ruined his son's life.